This treatise follows an essay entitled “On the Nature of Sireniae and Selkies” (Ravenwood Press, 1842). It expands upon matters alluded to, though not fully addressed, previously. Further guidance is provided also which we hope will make this the definitive work on the subject. It should be noted that the new material has been made possible as a result of research by the Institute of Marine Sciences; in particular the work of Professor James McIntyre and Dr. Clara Daws. The authors wish to pay tribute to Professor McIntyre’s son, Stephen, who was lost at sea while on a sample collecting voyage in the Gulf of Mexico. Stephen McIntyre’s aquatic fossils, and microbe samples from deep within the Norwegian fjords, proved invaluable in his father’s research and, indeed, in helping us complete this second treatise. According to Prof. McIntyre, there is very little anatomical difference, at least in the British Isles, between mermaids and selkies once they have assumed human form. In their natural state, however, they are quite different. Five years ago legislation was passed that selkies or mermaids taken from the sea as prospective wives, must sign a document affirming their agreement to remain on land. Several Parliamentarians see little difference between this and the arranged marriages common on the Indian subcontinent. It is not the purpose of this treatise to engage in political debate on this topic. However, the authors deem reference to the debate useful, if only to provide a context for the argument herein. We also wish to make it clear that it is the welfare and happiness of such “seal wives” that has prompted this and our previous paper. The first issue we must address, surely, is that of clothing. We know from our studies that the former denizens of the deep are unfamiliar with issues of modesty. Indeed, several who spoke with our field researchers, told us they assumed the clothing the men wore was actually their skin, and that the concept of clothing was alien to them. When a mermaid leaves the sea, and her tail, behind, she assumes the form of a human female. Invariably of preternatural beauty. The only remnant of her former life is the somewhat startling silver-pupilled eyes. It is imperative, therefore, that mermaids be educated into what is and what is not acceptable in polite society. The husband of such a wife must, we believe, be a man of sufficient means to adorn her only in the finest silks. Poorer grade materials such as cotton and wool, for example, are likely to be discarded. Several interviewees explained that rough fabrics brought them out in a rash, while others told us certain clothing made them feel claustrophobic. Our understanding now is that the government-funded team of mermaid educators have had to concede that corsets are not obligatory; had they insisted upon the wearing of the constricting garment, it seems, a man might well find his wife one day serving dinner to his guests quite naked. The silken garments should naturally be opaque. Or several layers worn so as not to reveal so much as the shadow of the form beneath. Ideally, they should be loose, somewhat like a nightgown, as any form of constriction might lead the mermaid to be “inappropriate” in company. Shoes are a matter of personal preference. But the wife should always be given a choice between silk slippers, or bespoke footwear. Or indeed, of remaining barefoot, if she prefers – unless she is outdoors, where broken cobblestones or gravel might cause injury. Accommodation is equally important. Bedrooms should be kept cool, and bedclothes light. Mermaids have an unfortunate tendency to overheat. Indeed, some have been hospitalised as a result of sleeping beneath a goosedown quilt. While we appreciate even the wealthiest individual may not be able to afford a room-sized aquarium, cold baths and open windows are highly recommended. As to the subject of nutrition, there has been a great deal of speculation. We know with certainty that mermaids, like homo sapiens, are carnivorous. Their preference is for live fish or crustaceans. Not an easy meal to provide unless one happens to live in a fishing community or close to a port. Cooked fish is acceptable, though it should always be served entire with eyes and organs intact. Salted fish, such as herrings from a barrel, are easily digested by mermaids. However, their preference is for living flesh. Distasteful as this may be for most of us, allowance must be made for cultural difference. Consider this. We happily breed cows and sheep, only so they may be slaughtered to provide beef and mutton for our supper tables. Similarly with poultry, game, rabbit, hare and other beasts of the field and the air; all is grist to the mill for our boundless appetites. Other races are different again, from the Esquimaux eating raw seals, to pygmy tribes with their unique palette for boiled Christian missionary. Why them should we turn up our noses at creatures with the simplest diet of fish, prawns and lobster? Doubtless it is because of this prejudice that the myth of mermaids luring sailors to their deaths is perpetuated. Studies have proven that merfolk are, by and large, peace loving. There is absolutely no evidence to suggest that they mutate into grotesque monsters that rip unwitting seafarers into bloody rags below the waves. Providing a good diet, therefore, is important if a man is to cherish and nurture his chosen partner. Be she mermaid or not. In the absence of fish – salted, smoked, or alive – fresh blood will serve equally well. Exsanguinating a cow, a deer or, God forbid, your pet dog will not, you will be pleased to hear, serve the purpose. Only human blood, which is arguably richer than that of a trout or a salmon, will do. There are accounts of men who will unstintingly drain some of their own blood into a wine glass for the sake of their beloved mermaid wives. Such tales may be apocryphal, but they do speak to the best part of our nature as human beings. We have in the Natural History Museum in London the diary of such a man, one Albert Proudfoot. Proudfoot, a former infantryman who served with Her Majesty’s forces in India and Africa, was given medical retirement as the result of a heart murmur. He was 25 years of age when he married a young woman named Chloe. Chloe had hitherto been unknown to Albert’s family. Evidently they saw very little of the woman while they lived in Oxford. And nothing more of the couple when they retired to a woodland retreat somewhere in the Scottish Borders. The winter of 1814 was especially harsh and roads and tracks were impassable. Come spring, when Albert’s and Chloe’s neighbours saw no sign of the couple, two men volunteered to take the nine-mile hike to the cottage. What they found is a matter of record. Though it merited but a brief obituary in the Borders Telegraph and a short paragraph in the Oxford News. Albert’s body, supine in bed, was only a little decayed; it had been preserved longer than was usual by the icy conditions and the snow that had blown through the smashed bedroom window. Of his wife there was no sign. On the bedside table they found Proudfoot’s journal. Albert had recorded significant events in his life from his period in the army until the present day. He spoke of skirmishes and near death experiences with bandits in India; of combating malaria; of the utter boredom most days in the army. The crucial entry, for our purposes, is his account of a walk along a stretch of coastline near Portsmouth one squally autumn day. The moon had disappeared behind the clouds. Albert briefly lost his way in the dark and stumbled over some rocks. When the moon reappeared it illuminated a patch of silver. At first he hoped it might be valuable jetsam, perhaps a coin chest from a sunken ship. Upon closer inspection he found, as he expressed in his journal, “something beyond the price of rubies”. That his valuable discovery was in fact a mermaid is evident from a late passage in the journal, although he does not use the word “mermaid” once in the entire account. He calls his find “my darling Chloe”, by which we are meant to assume, presumably, a half drowned woman, and not a sea creature. It is only later, when we must suppose the author is half-delerious, that he inadvertently reveals her true nature. Later pages of the journal relate in vague terms a happy marriage. Though Albert gives more space to neighbours and “so-called” friends who had effectively ostracised the newlyweds. He does not go into the reasons as to how this came about. But of his scorn for their behaviour we are left in no doubt. The penultimate section of the journal speaks in vivid detail of the harsh winter. The sudden snow. The ice sealed the river to a depth of half a metre and caused his wife, he writes, “untold distress”. While the larder was well stocked with dry goods, salt fish, powdered egg, flour, sugar and other staples, the weather began to make it impossible to hunt. Albert had been brought up on a farm, and could hunt by most conventional means: with guns, traps and snares. He was also handy with a fishing rod, which, sadly the frozen river made a useless skill. “Chloe is fading fast. And I am not far behind her, I fear. We have packed barrels and buckets, and even the tin bath, with snow, and set them around the fire to give us meltwater. I have kept some of my strength by eating preserved pig fat, but the merest smell of it makes Chloe unwell. The salted fish is all but gone. “On two or three occasions I opened my wrist with my old Army razor. I did so behind Chloe’s back, as she would rather die, she said, that have me sacrifice my health for her. Nevertheless, having drained off almost half a pint, I begged her to drink it from a porcelain mug bearing an image, ironically, of a four-masted clipper at sea. She swallowed the hot broth gratefully, but with tears streaming down her face. “My beautiful girl told me through sobs that had her life been more important to her than mine, she would have drunk directly from my open veins. Not only would that have saved her life, and kept her in robust health for weeks, perhaps even a month, but it would also have condemned me to become one of her own people. When I said I desired nothing more than to be with her under any conditions, she believed this was too high a price to pay. There is a break in the account here, then an undated passage which is hard to read because of the now understandably terrible penmanship. And the terrible event which occasioned it. Nothing was heard of Chloe again. Nor were any sightings of her reported. Which brings us to our next topic, one that is every bit as important in its own way as the imperatives of shelter, clothing and food. That topic is society. One argument has it that Albert Proudfoot concealed his wife from society because he was afraid that other men would desire her. Which was, given the searcher’s remark, a reasonable fear. Except that, if the journal account is an accurate reflection of their relationship, Chloe loved her husband in way that was both all encompassing and exclusive. A more likely explanation is the snubbing they received at the hands of friends and relatives. By withdrawing from society, then Albert was “returning the favour” to all who had rejected the couple. Notwithstanding Albert Proudfoot’s “pride”, as it were, our position is that it is important to offer merwives education and appropriate social interaction. Undersea folk have their own sciences, history and mythology. As for music, it is believed they sing, but principally as communication rather than for entertainment. We now know from research that mermaids are entranced by our music, particularly when it is played upon instruments rather than sung. The voice of even our best opera singers supposedly offends the shell-like mermaid ear. Yet these former oceanic females appear to relish conversation. And while they seem happy to discourse solely with their husbands, surely it is only right and proper they be given the chance to broaden their education within society at large? According to parish records of the year 1840 there were 530 mermaid wives in circulation. Some are believed to have befriended human women in their communities. Others, sadly, were paraded around like circus freaks. One individual, a city banker no less, accepted large sums of money for his merwife’s “services.” Fortunately the courts recognised the repugnancy of his behaviour and sentenced him to three years in prison. Teaching a mermaid to read, however, is another matter. Marine biologists have discovered that marine mammals as well as fish, can detect vibrations in the water. But whether this is due to skin sensitivity, brain function or bone resonance (as is the case in our own ears), is a matter for further research. Dr Franklin had nothing to say on the biophysical transformation a mermaid must go through in order to pass for human. How this miraculous mutation occurs continues to baffle science. In any event, the transfigured mermaid loses both tail and gills. Legs replace the tail and lungs take over the function of the gills. Nevertheless, she has a great capacity for learning and, given the opportunity, a mermaid can be an asset to any social gathering. Provided, of course that she does not out of the blue evince problems with her clothing and disrobe during dessert. Other aspects of the physiology are likely to remain a mystery for decades to come, as to date no mutated marine female has left her corpse to be studied by anatomists. Mainly because they can live to the ripe old age of 300 years or more. This latter fact inspired several cult movements, such as the Neptune Society, and the Atlanteans. The Atlanteans believe that merfolk are actually our ancestors, and that they evolved from a group of rebel submariners at odds with the reigning authority some 20,000 years before the birth of Christ. They are furthermore convinced that the holy grail is not the cup of Christ, but a mystical conch shell which turns simple seawater into the wine of immortality. One question remains on the subject of our discourse. It may appear that the care and maintenance of mermaids is the responsibility of their human husbands. Not so. Mermaids, after all, have their own minds, and wills and impulses. In common with us shorter-lived mortals, they are subject to emotions such as excitement, boredom and, as Albert Proudfoot’s journal admirably illustrates, fear and depression. So why then voluntarily elect to become human? Or as close to human as is possible for a species in every sense separate from us? Or it may be they leave the sea in pursuit of love, as several best-selling romance novelists would have it. Glossing over the penny dreadfuls with such low titles as “Mermaids in Chains”, we cite such tomes as “Meromancy” and “The Seal Wife and the Sea Captain” by a certain Jane LaBelle. Miraculously, Mrs. LaBelle’s oeuvre was the subject of a flattering essay in the Literary Review by an Oxford Don, Sir John Laverty. That the essay entirely lacked the irony such potboilers usually merit should come as no surprise when one learns that Lord Laverty is none other than the husband of said Jane LaBelle. In any event, it is of paramount importance that readers of our treatise understand that mermaids are children of God, just as much as we are. They are born and, eventually, they die. In the space between these two remarkable events they experience the same griefs and joys as ourselves. They do not simply “exist” as plants and animals do. They do not come here to be servants or unwilling life partners. As for how they feel about leaving their birthplace behind, have we not amply evidenced that they regard us – or most of us, excepting incarcerated bankers and their lecherous clients – as no different at heart than themselves? One man I know of, but whose name I exclude to respect his privacy, married a mermaid not too long ago. Their relationship began, as do most relationships, with simple conversation. Each evening for a month he would walk down to the shoreline below the town of Brighton and talk with her about his world, while she spoke of her own. As night was invariably falling during their liaisons, there were few passers by. When someone did happen by, man and mermaid would hide in the shadows of sand dunes, or he would drape her in his coat until the stranger was gone. From there, the relationship blossomed into love. He nurtured her, educated her and introduced her into society. She was always welcomed most warmly by the man’s friends, though their curiosity as to why she wore tinted spectacles indoors as well as out, merited explanation. The man told them his wife had a rare eye condition which made her photosensitive. Have you ever seen a mermaid light up with delight when she hears a Brahms symphony or a Bach concerto? Have you listened as she discusses the cellular structure of an oak leaf, even when she can barely distinguish more than its general shape and colour? When someone says something offensive about her marriage, or what her husband gains from it, how wonderful she seems in her regal gentleness and empathy for those who cannot possibly understand. We cannot stress enough, therefore, that the care and maintenance of mermaids, if carried out to the letter, not only benefits this beautiful creature, but the carer himself. In due course, all being well, the caretaker can at last relinquish his duties so that his wife, having also gained an education, can stand beside her husband as a true equal and, more importantly, a “soul mate”. 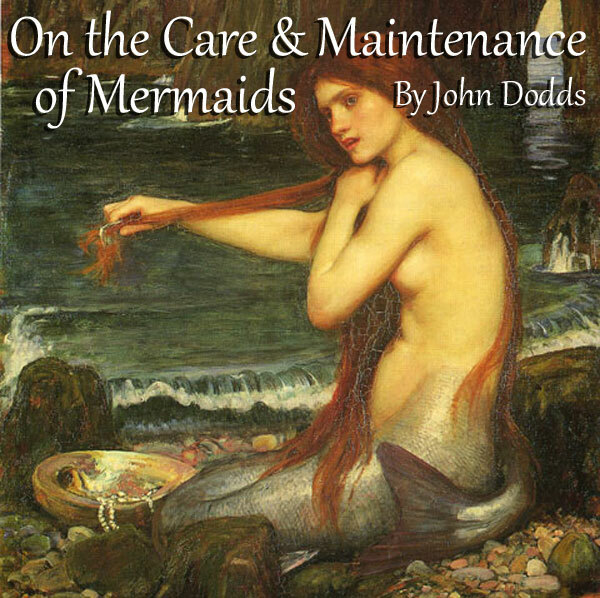 Ravenwood Press is sad to announce the disappearance, and presumed death, of the author of this treatise, “On the care and Maintenance of Mermaids,” Mr. David Symons. Mr Symons was reported missing the week before we were due to go to press. The whereabouts of his wife of 14 months, Cordelia (coincidentally a Celtic word meaning “jewel of the sea”), is also unknown. A report in The Times of 18 April, said the police had responded to a call by Mr Symons’ sister who was concerned that he had not been in touch for a month. Upon further investigation it was revealed that he had not reported for work as deputy librarian at King’s College. The police found in the Symons’ home, no signs of forced entry, or any indications of foul play. Entwined in the jacket was something the man initially mistook for seaweed. It proved to be a second garment – a woman’s nightgown of the finest Thai silk.